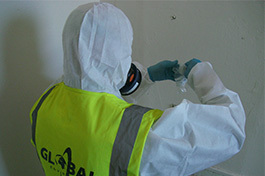 Global Environmental provides a reliable and responsive asbestos surveying service to support refurbishment programmes and supplement asbestos management plans. Our team of fully trained surveyors has practical experience of inspecting all property types from residential premises to offices, industrial buildings, schools and hospitals. We can locate and identify the presence of asbestos containing material and assess the risk to the inhabitants. Depending upon the circumstances and the threat, surveys may involve visual inspection, non-intrusive sampling and destructive sampling. All surveys are carried out in compliance with HSG 264 and conducted in accordance with Regulation 4 of the Control of Asbestos Regulations 2012. Management Surveys – representative samples of suspected asbestos containing materials are collected on-site and analysed in our laboratory to verify the presence of asbestos. Pre-Demolition / Refurbishment Survey – a full sampling programme is undertaken to identify asbestos containing material and the extent to which they are used. This type of survey is detailed and may involve destructive inspection techniques. All our lead surveyors are required to sit the British Institute of Occupational Hygienists (BOHS) P402 module, Building Surveys and Bulk Sampling for Asbestos and are trained to carry out the testing activities in accordance with our in house quality procedures. Global’s asbestos surveying is UKAS accredited: The company was awarded certification against ISO 17020, the standard of competence for inspection bodies by UKAS in April 2013.